March 31st : Farewell Closed Beta, Hello Open Beta! League of Angels II, our newest epic free to play MMORPG, has been generating quite a buzz since we announced the game earlier this year. Under development for 2 years, League of Angels II combines an advanced 3D engine, beautiful animations and effects, and epic storytelling to create a rich and unique fantasy world. There’s no shortage of action or strategy as players embark on their grand quest to save Sapphire. The game was designed from the ground up to push the limits of next-gen web games. Last week, League of Angels II’s mysterious veil was lifted to a group of lucky players, but many more were eager to get their hands on the game. 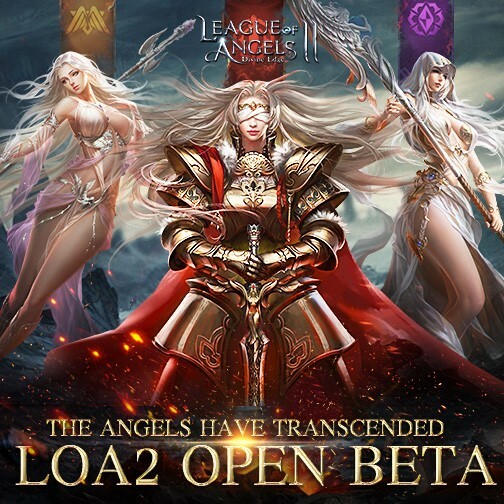 Today we are very excited to kick off the official Open Beta and invite everyone to experience League of Angels II! For League of Angels II’s Closed Beta, we limited beta invites to 5000 players to test the game in a more controlled setting. With the start of Open Beta, activation codes are no longer required so everyone can jump in and start their adventure. Customer and Recharge services will be available for the Open Beta and there will be no more account wipes from this point forward. During the Closed Beta, the level of enthusiasm shown by the players was inspiring. Some even took days off work to enjoy the game as much as they could. The player feedback we received was tremendously helpful and we are very grateful to all our beta testers. During this week-long adventure, the contributions of our testers have shaped the future of their game. Over 800 threads sprang up on the League of Angels II forums. Everything from game bugs to language and UI optimization to gameplay design received great amounts of feedback, and the new Open Beta client will have many improvements and optimizations. The game’s Open Beta Mini Client is already available and players can download the client for a smoother game experience. Players can find the download link for the client on the left side of LoA2’s official website. League of Angels II is always undergoing improvement, so we encourage all players to hop on the official forums and post their feedback of the game. Join our efforts to craft the perfect game, and show the world that “The Angels Have Transcended.” Come experience one of the most epic free to play MMORPG’s of 2016! Next：LoA II Closed Beta Successfully Launched!